Horsham head coach Nick Stocker saw his side pass the ‘defining test of their promotion aspirations’ away to Old Colfeians. 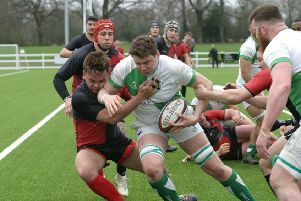 The Green and Whites made it nine straight wins in London 2 South East with a 62-38 triumph. The hosts had already secured league and cup wins over Horsham earlier in the season, and with the visitors not having won at Horn Park before, yet requiring a victory in their pursuit of second place and a promotion play-off spot, the pressure was on. And they delivered against top-class opposition who are through to the national semi-final of the Intermediate Cup, coming back from 24-7 down after 23 minutes to score 55 points without reply. Jamie Redmayne touched down twice, Declan Nwachukwu scored four and Mike Watts three, along with seven Tom Johnson conversions and a penalty in Horsham’s impressive tally. Stocker said: “This was always going to be the defining test of promotion aspirations. Travelling away for the penultimate game of the season against strong opposition who fielded a full team to maintain momentum on their own quest for Twickenham glory, watched by a large vice-presidents’ lunch crowd would always ask questions of most teams. “That certainly was the case with the lads starting slowly and despite getting on the scoreboard first, the basic error count was mounting which allowed Colfes to surge into a 24-7 lead. Thereafter Horsham started to relax into the game, played to our structure and stretched the defence creating holes that our dangerous runners could exploit. “Initially overturning the deficit and securing the lead by half-time and then accelerating away which saw a steady stream of tries based on high skill set executed at pace. “The result was 55 unanswered points between the 24th and 76th minutes of the match in a spell of great teamwork, aggressive defence and strong set-piece work. Particularly at scrum where the quality of the ball won helped launch attacks that saw four tries come from that first phase. “With such a complete team performance it was hard to single out players and we eventually awarded a shared man of the match across the team. The visitors led after just one minute as Nwachukwu collected the kick-off and drove to the line before being tackled and Redmayne went over with Johnson adding the extras. A series of weak Horsham tackles the let their hosts back in for a converted try, before a penalty soon after made it 10-7 on 17 minutes. Five minutes later they ran in an intercepted try and from the restart the ball was soon spun wide from a lineout to make it 24-7. Horsham hit back as props Giles Barber and Kyle Fairs broke, before Redmayne put the ball down. Jack Osgood then started another move and found Nwachukwu, who charged down the wing to score. Johnson’s extras took the score to 24-19. In the closing stages of the half, Watts finished off a great multi-phase play to score and give Horsham a narrow lead of 26-24. Horsham added an early penalty, then a wonderful Watts dummy allowed him to score another converted try for a 36-24 lead. Further tries followed for Nwachukwu – a hat-trick of scores in fact and Watts as Horsham continued to run rampant in the second half, before two late tries from Old Colfeians. Horsham: Barber, Fairs, Cass, Osgood, Goward, Redmayne, Everitt, Whiting, Linfield, Bell, Nwachukwu, Johnson, Widle, Pecharman, Watts. Subs: Powell, Smith, Hampson.